Typed Letter Signed, on official 6 ¾” x 9” stationery as Oregon governor. In this excellent communication, Olcott expresses thanks to “Mr. Binger Hermann, Roseburg, Oregon,” for sending a newspaper containing an article written by Hermann. Governor Olcott concurs in Hermann’s denouncement of the Ku Klux Klan, at the time an ascending, openly acknowledged presence in the politics of the state. As secretary of state, Olcott assumed office after the death of Oregon Governor James Withycombe on March 3, 1919. 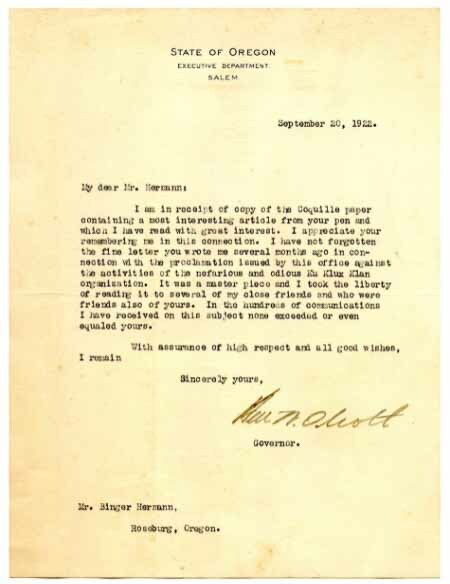 Refusing the support of the Klan, Olcott won the Republican nomination for governor, but was defeated in the 1922 general election – just weeks after the steadfast disgust affirmed in this letter - by Klan-backed state Senator Walter M. Pierce. The letter is lightly and evenly toned, with a center horizontal fold and scattered minor staining.